There is a ratio of calories burned at rest based on your current weight though, but it isn’t mysterious. It is actually a very observable constant. For me it is about 11*your weight/day= calories. For women it is about 10. That can vary a bit if you have more or less muscle ratio (more muscle, more calories) or various other body factors, but not by much. It isn’t mystical though, it is just the fuel requirement based on the mass of the machine it needs to operate. Starvation mode will kick that down significantly by making you sleepy and slowing down your cardiac rate, which can cause complications with your health. I don’t doubt that bigger bodies require more calories. That’s not the claim I am arguing against. It is entirely possible I missed the point. 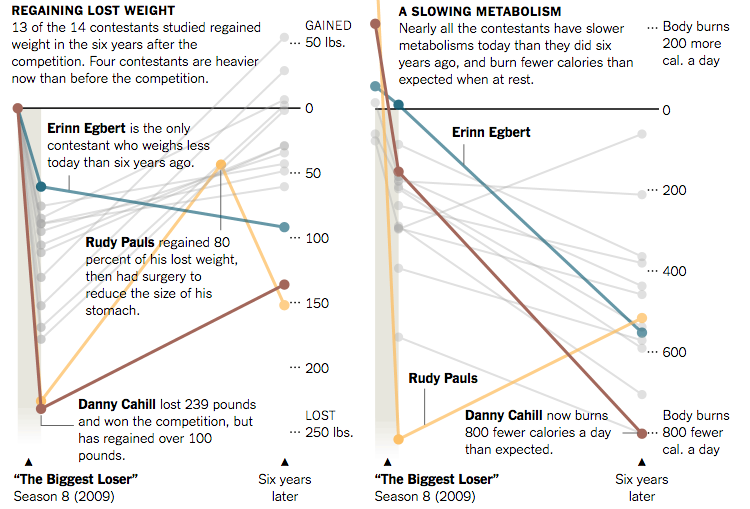 If you are referring to the recent curfuffule about the Biggest Loser contestants who gained it all back, you are correct. Their bodies didn’t fight them back to that weight, it was due to failing behavioral habits. I don’t know anything about The Biggest Loser but I believe the prevailing consensus is that your body requires less calories when you lose a lot of weight which makes it harder to lose weight when you have lost a lot of weight (beyond your observation that smaller bodies require fewer calories – which I acknowledge and agree with). I think your argument is too broad and the terms aren’t well defined. I would agree that at a very general level, less calories will slow or reverse weight gain, and the simple calculation from The Hackers Diet holds true. 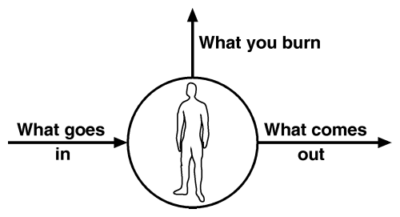 If you define what you mean as “what you burn” and “what comes out”, as well as taking into account the composition of the rubbe…uh…body, it’s not precise for some needs. Just like “weight” is not an absolute measure of health, or whatever you’re trying to evaluate with your calculation. So, I interpret what you’re saying as “For my purposes, the simple calculation from The Hackers Diet is good enough”. Just like BMI is good enough for actuary tables in the insurance industry. “This is why most diets don’t work (according to mainstream science).” < I think "science" is too strong a word for mainstream nutritional advice. I accept all your criticisms. I did not define my terms well and did not research my subject well enough to be clear with my thoughts. I was also drinking vodka. I’ll add a postscript to clarify my argument.